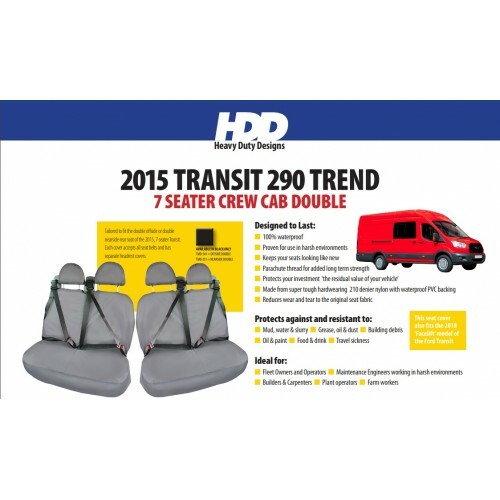 HDD 2015 Ford Transit 290 Trend Crew Cab Double NEARSIDE REAR Seat Cover (Separate Headrests) BLACK 551 Heavy Duty Designs - Free Delivery ! TAILORED FIT FORD SEAT COVERS 2015 FORD TRANSIT 290 TREND CREW CAB NEARSIDE REAR SEAT COVER WITH SEPERATE HEADRESTS ALLOW..
HDD 2015 Ford Transit 290 Trend Crew Cab Double OFFSIDE REAR Seat Cover (Separate Headrests) BLACK 541 Heavy Duty Designs - Free Delivery ! TAILORED FIT FORD SEAT COVERS 2015 FORD TRANSIT 290 TREND CREW CAB OFFSITE REAR SEAT COVER WITH SEPERATE HEADRESTS ALLOWS..
HDD 4x4 Pickup Air Bag Compatible Universal Fit Front Seat Cover BLACK 211 Heavy Duty Designs - Free Delivery ! AIR BAG COMPATIBLE SEAT COVER Heavy Duty Material Reduces Wear and Tear on Vehicle Non Slip Nylon ..
HDD 4x4 Pickup Air Bag Compatible Universal Fit Front Seat Cover BLUE 212 Heavy Duty Designs - Free Delivery ! 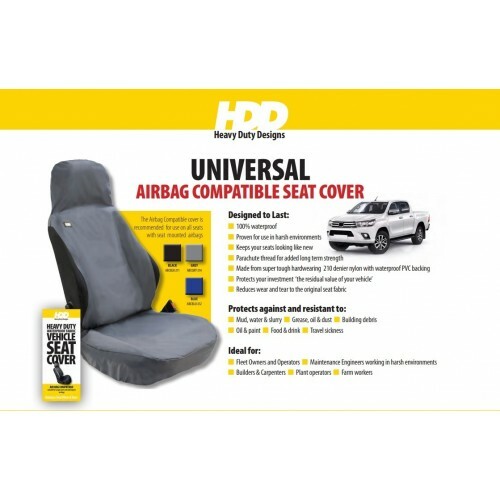 HDD 4x4 Pickup Air Bag Compatible Universal Fit Front Seat Cover GREY 214 Heavy Duty Designs - Free Delivery ! 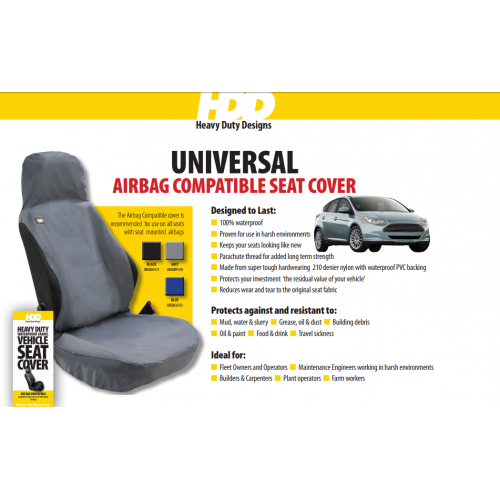 AIR BAG COMPATIBLE SEAT COVER Heavy Duty Material Reduces Wear and Tear on Vehicle Non Slip Nylon Heavy.. Heavy Duty Material Reduces Wear and Tear on Vehicle Non Slip Nylon Heavy duty design vehicle seat covers are fully water.. Heavy Duty Material Reduces Wear and Tear on Vehicle Non Slip Nylon EXAMPLE PICTURE - COVER ORDERED WILL BE BL.. 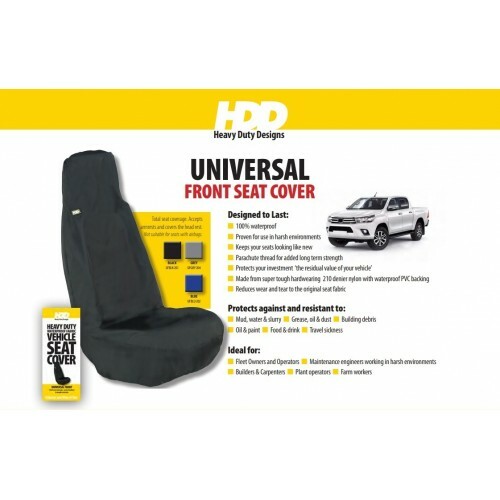 Heavy Duty Material Reduces Wear and Tear on Vehicle Non Slip Nylon EXAMPLE IMAGE USED - COVER SUPPLIED WILL B..
HDD 4x4 Pickup Universal Winged Front Seat Cover BLACK 221 Heavy Duty Designs - Free Delivery ! LARGE FRONT SEAT COVER Heavy Duty Material Reduces Wear and Tear on Vehicle Non Slip Nylon EXAMPLE PICT..
HDD 4x4 Pickup Universal Winged Front Seat Cover BLUE 222 Heavy Duty Designs - Free Delivery ! 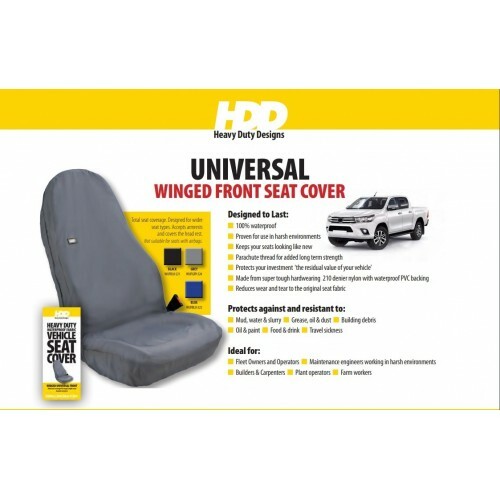 HDD 4x4 Pickup Universal Winged Front Seat Cover GREY 224 Heavy Duty Designs - Free Delivery ! LARGE FRONT SEAT COVER Heavy Duty Material Reduces Wear and Tear on Vehicle Non Slip Nylon Heavy duty d..
HDD Air Bag Compatible Universal Fit Front Seat Cover BLACK 211 Heavy Duty Designs - Free Delivery !